1 Will Others Want The Same? Will Others Want The Same? When Barnstaple Rural District Council decided to spend over £8,000 on the provision of a playing field at Fremington, several members expressed the view that this might lead to other parish councils expecting the Rural Council to provide playing fields for their locality. After a lengthy discussion in committee the Council decided by 20 votes to five to purchase the two acres of land at Woodville for a playing field. The marriage took place on Saturday, August 7th, in Fulham, London, of Mr George E Bugg, son of Mr and Mrs F Bugg, of Fulham, and Miss Hilda Rose Smale, daughter of Mr and Mrs T Smale, of Hill Top, Fremington. The bride, who was given away by her father, was in a delightful blue dress trimmed with white pique. Her hat was of a similar colour and her flowers were carnations. Mr A F Scott was the best man. A reception was afterwards held at the home of the bride's aunt, Mrs E Scott, 48 Fenborough Road, Fulham. A Fremington horse breeder is planning to start a stud for Arab horses, one of the world's top show animals and a rarity in North Devon. Miss Susan Pulsford wants to make this breed - which can be traced back to 2,000 BC - a regular competitor in North Devon show circles. 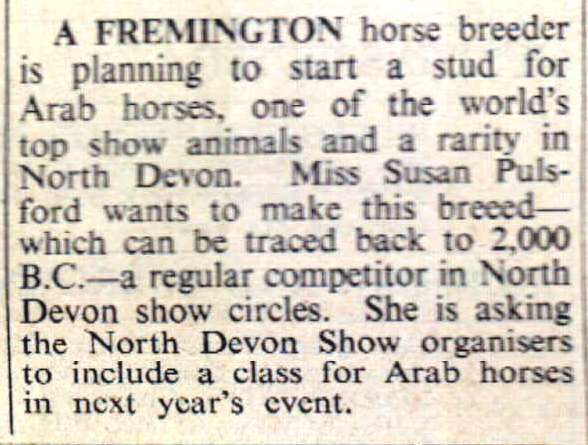 She is asking the North Devon Show organisers to include a class for Arab horses in next year's event. If Mr Wallace Day, of Lower Yelland Farm, Fremington, who scored a sensational victory in the the nationwide election for a special seat on the Milk Marketing Board, achieves another ambition housewives will be paying an extra 2p for a pint.